250th anniversary commemorative edition published in 2007. Multi-brigade battles of the old regime. For the War of the Austrian Succession and The Seven Year’s War of Frederick The Great. 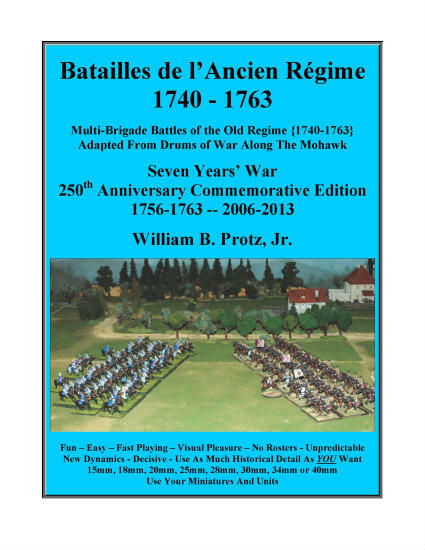 Adapted from Drums of War Along The Mohawk but vastly different and updated for Europe. For 15mm to 40mm miniatures. Flexible organizational structures. Fun, easy, fast play, decisive, visually stimulating, appealing photos, historical, companionable. Quick Reference Chart #1 is for larger wargame tables and military formations. Quick Reference Chart #2 is for smaller wargame tables and military formations. Simplified 18th Century unit drill diagrams. Learn and enjoy doing new maneuvers you did not think possible. Based on the most modern secondary sources seconded with 18th Century translations.